If you’ve ever wondered, when should you use ibuprofen? This graphic is for you! Please consider it in consultation with your physician and implement at your own risk. 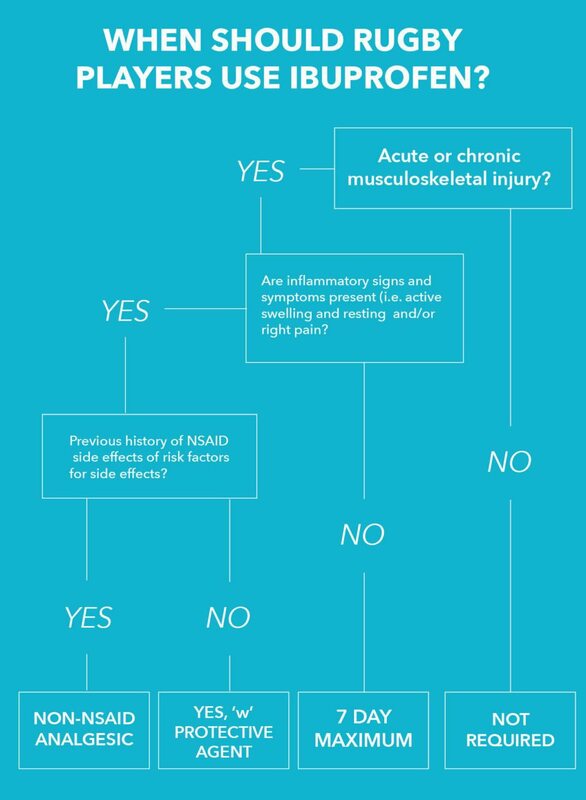 Our piece earlier this week went into great detail re: the risks associated with the prolonged use of NSAIDs. Check it out for some good background info on the topic of ibuprofen use in the rugby community and the effects of NSAID. It includes an analysis of the biochemistry behind COX inhibitors. Today, we’re going to keep it super-brief. So brief in fact, that we can explain the whole concept in a simple info-graphic. These recommendations are based on the work of Dr Stuart J Warden who works in the Department of Physical Therapy, School of Health and Rehabilitation Sciences at Indiana University. His seminal work Prophylactic misuse and recommended use of non-steroidal anti-inflammatory drugs by athletes was originally published almost 10 years ago. Yet it seems even in that time that the chronic misuse of ibuprofen by rugby players has continued. With a little luck, this graphic will get around the traps and we can all use it to make better decisions about the way we use over the counter non-steroidal anti-inflammatories. We created this chart so that ibuprofen, rugby and you can get along together. As long-time ibuprofen users ourselves, we felt it was necessary to finally to tell rugby players about the risks associated with prolonged ibuprofen use. Fingers crossed you’ll take some of our advice to heart and there’ll be no need for the ibuprofen rugby chart in a few years time. As with any of the advice you find on ruckscience.com, please consult a physician before using any kind of medication. This recommendation is not intended as a substitute for professional medical advice.